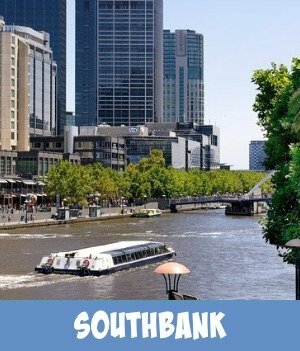 Situated in the Southbank Precinct on Riverside Quay, the tower dominates the skyline overlooking the Yarra River. Construction on the skyscraper began in August 2002. Built in stages, the interior was completed in late 2006. Once reported to be the highest residential tower (measured to its highest floor) until surpassed by the Ocean Heights and the HHHR Tower in Dubai. It is the second highest tower in Australia and as of 2016, it is the 15th tallest residential building in the world. During the gold rush in 1854 in Victoria, there was a rebellion. The Eureka Tower has been named after the Eureka Stockade uprising. This moment in Victoria's history has been incorporated into the of the skycraper. The buildings gold crown represents the gold rush and a red stripe represents the blood that was spilt in the violent uprising. The Eureka Stockade's blue background is represented by the blue cladding that covers most of the building. The white lines also are part of the flag's representation. The white horizontal stripes also represent markings on a surveyor's measuring stick or rod. 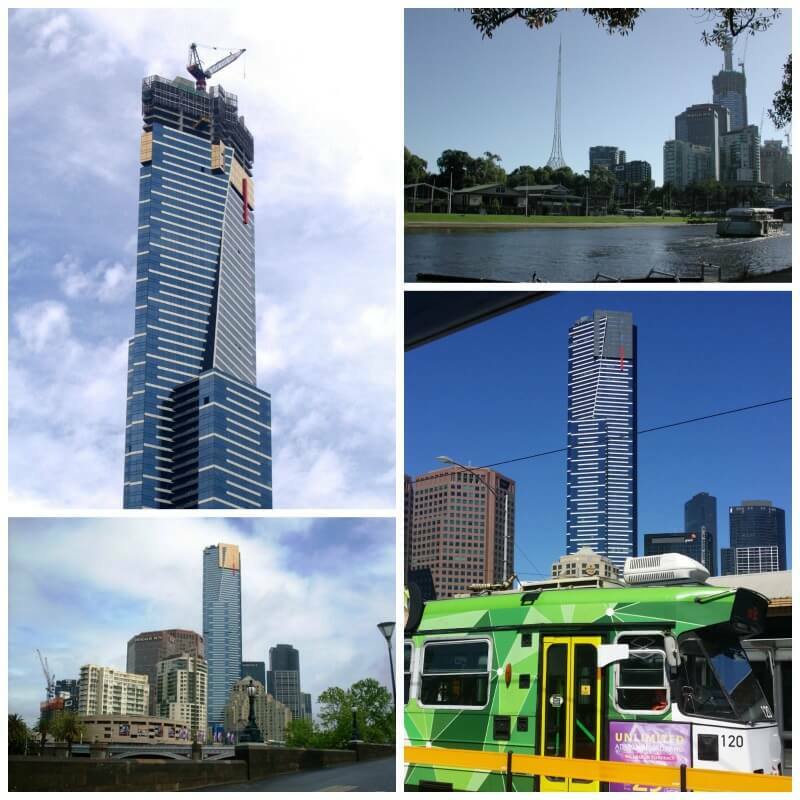 Where is the Eureka Tower Located? There are plenty of public transport options. From Flinders Street Train Station, simply walk five-minutes over the bridge to the other side of the Yarra River. Multiple trams also service the Southbank area, particularly along St Kilda Rd, a short walk away from Eureka (check out Public Transport Victoria for detailed route information). Easily accessible by car, Wilson Parking “Eureka Car Park” is located right beneath the Eureka Tower on the corner of City Road and Southgate Avenue (enter via Southgate Avenue). 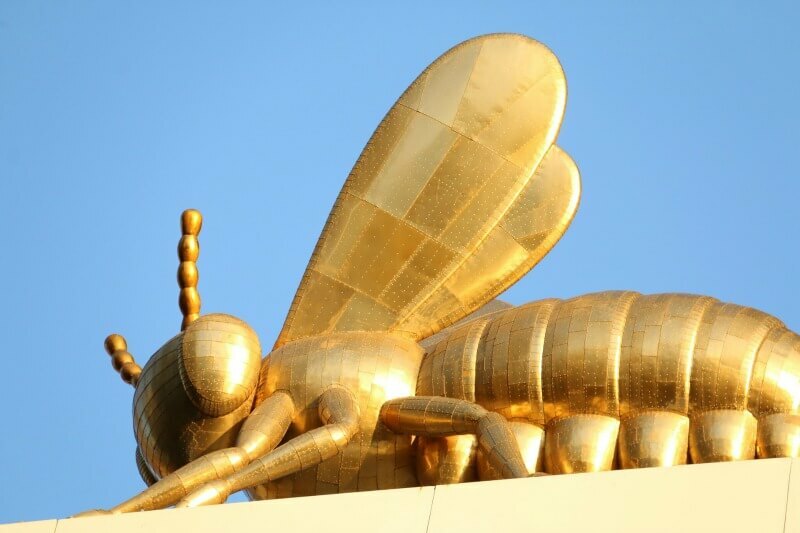 Just above the base of the tower, you will see an art installation that contains golden bees. The box is supposed to represent a bee hive with several of the bees standing outside the box and the queen bee sitting on the top. The golden colour of the bees is tied in with the colour of the gold at the top of the tower. 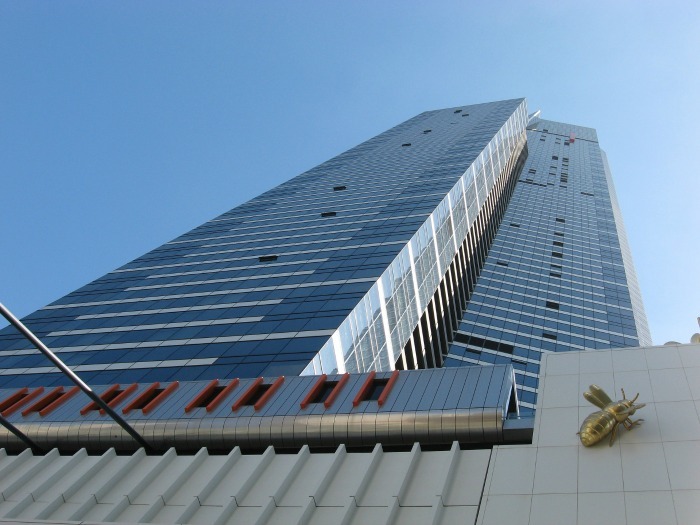 Eureka Tower has 24 carat (99.9%) gold plated glass windows on the top 10 floors of the building! When the sun shines on the bees at a certain time of the day, the spectacle is beautiful to see. At a certain angle of the sun during a clear sunset, the top of the tower glows like a solid block of gold. Amazing capture if you time it right! The single level basement and first 9 floors contain car parking. There are 84 floors of apartments (including some floors shared between car parking and apartments), with the remainder being used for building facilities and the observation deck. The highest floors of the Eureka Tower house an observation deck (level 88), restaurant (level 89), communications room and balcony (90) and water tanks (90 and 91). A system of pumps constantly moves water between the two 300,000 litre tanks to counteract wind-induced oscillations. The Observation Deck stands 285 metres or 935 feet above ground. It takes the elevator 38 seconds to get there, making it the fastest elevator trip in the southern hemisphere. 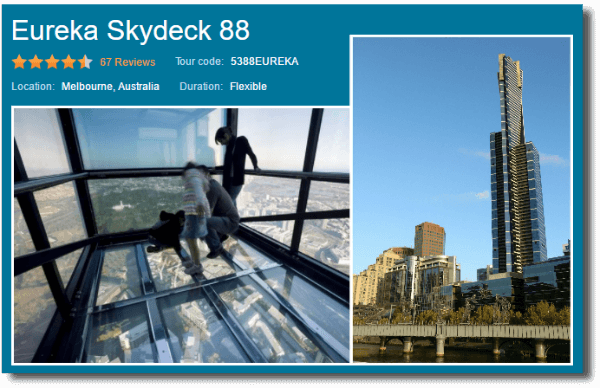 The 88th floor is occupied completely by this observation deck called Eureka Skydeck 88. This is the highest public vantage point in the southern hemisphere. Enjoy the 360 degree, floor to ceiling views over the city with are over 30 viewfinders. These help the visitor pin point specific landmarks throughout the Melbourne CBD and on a clear day, others in Melbourne's outer regions. There is a small outside area called the Terrace, this is closed for safety reasons, when there are high winds. One of the towers greatest features is the exciting Edge Experience. This is a glassed in platform that extends out from the building. It is a glass cube which projects 3 m (10 ft) out from the building with visitors inside, suspended almost 300 m (984 ft) above the ground. Wearing protective shoe covering, you enter the cube with the glass being opaque. As the cube moves out over the edge of the building the glass becomes clear. During this process you can hear a crackling sound adding to the terrifying experience. Note that the floor is also made of glass, so that as it clears you feel suspended in mid air out over the streets and buildings below. Want to capture an amazing memory of your visit to the Eureka tower, then indulge yourself in the Vertigo Experience. This is a green screen installation that gives you the illusion of hanging off the building, 285 metres above the ground. Pose yourself hanging, dangling or actually falling. Collect a 9" x 6" printed photo and digital copy ready for upload to Facebook, Twitter and Instagram. Eureka 89 is located on the top floor of Eureka Tower in Southbank Melbourne, this dining experience is one that you will never forget, offering breathtaking views, day or night time, over the Melbourne skyline, out over Port Phillip Bay, over the You Yangs and out to the Dandenong Mountains. With seating for tables of 2 through to larger groups of up to 24, dining at Eureka 89 is available Tuesday through to Saturday evenings from 6pm and also Sunday lunch, featuring a 5 or 7 course degustation menu. Reservations are essential and pre-payment is required. Bookings are available up to 4 weeks in advance of today’s date subject to availability. Contact the office on 03 9693 8889 for reservations. Eureka Climb is Australia’s biggest vertical race held at one of the world’s tallest residential buildings, Eureka Tower in Southbank, Melbourne. Experience spectacular 360-degree views of the city. See Melbourne’s most iconic landmarks, spot ships sailing on Port Phillip Bay and admire the Dandenong Ranges from the highest point in Melbourne. For the ultimate rush, upgrade to include entry to ‘The Edge’ – a glass cube that projects out from the Skydeck with you in it! You won’t miss a thing with the 30 complimentary viewfinders placed around the Skydeck floor. Walk through the air lock and go outside to ‘The Terrace.’ Feel the wind rush in your ears as you stand 975 feet (300 meters) above the ground. 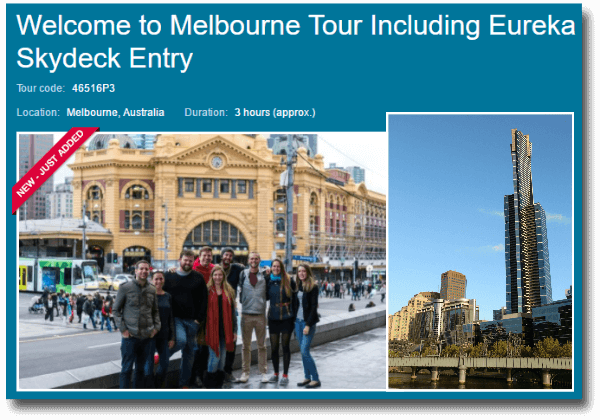 This 'coach tour' includes stops at the Queen Victoria Market, Captain Cook's Cottage (Fitzroy Gardens) and also a walking tour through the laneways and arcades of the city with it's cafes and interesting graffiti art. 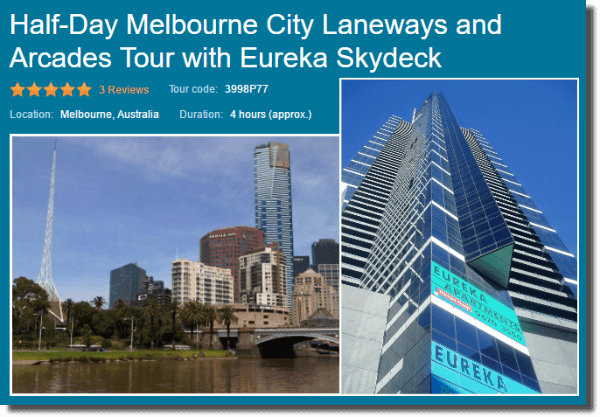 Then experience a birds-eye view of the whole of Melbourne up at the Eureka Skydeck. Just arrived to Melbourne? This is the tour for you. 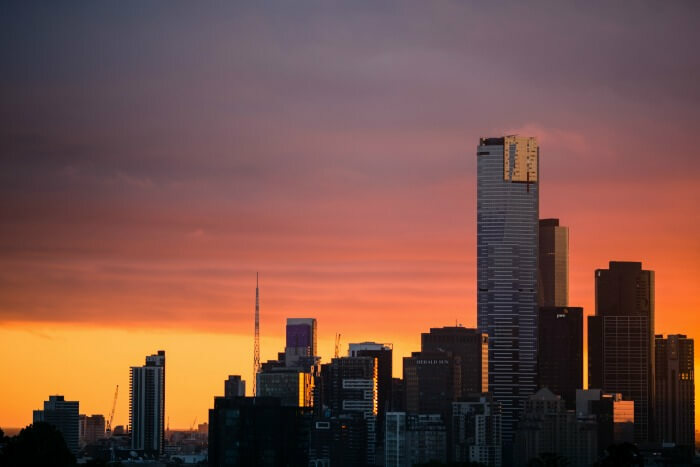 See Melbourne from high atop Eureka Tower, where your guide will point out their favourite parts of the city. Sample coffee, food and beer and finish the tour feeling like a local. Start your tour at the Eureka Skydeck, an 88-storey skyscraper that is home to stunning views of the city. Time to explore Melbourne’s famous street art scene. Your guide will take you to their favourite local restaurant for a hearty sample of one of the many cuisines Melbourne is known for. After you’ve finished eating, it’s time for a drink. 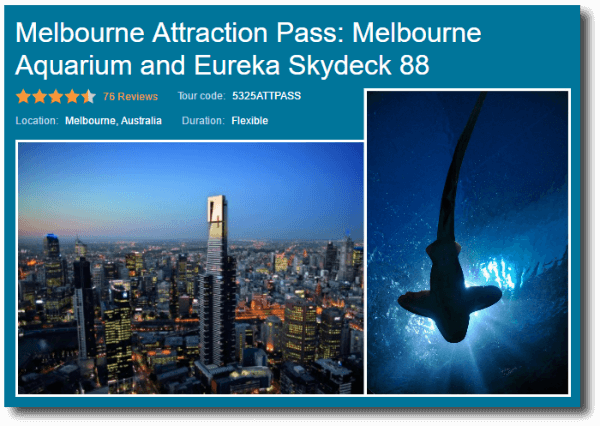 Save time and money with the Melbourne Attraction Pass! 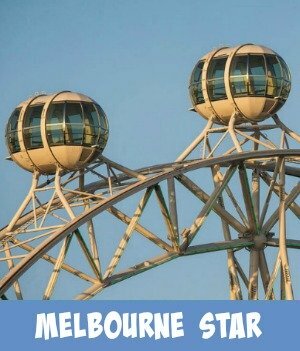 Visit two of Melbourne's premier attractions. Australia's largest aquarium offers a look into the amazing and different world of aquatic animals such as sandbar whaler sharks, grey nurse sharks, Port Jackson sharks, king penguins, gentoo penguins, freshwater sawfish, smooth stingrays, green sea turtles and big-bellied seahorses. 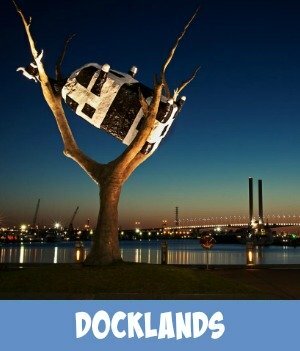 Visit Melbourne's newest attraction offering unparalleled views of Melbourne and surrounding regions.